What do we mean by reimagining community and justice? As Scotland’s justice system refocuses on community, what are the issues? Read on . . .
Buy your own magazine quality copy for $11.80 (about £8.30) from our MagCloud site. The copy should be delivered within about a week from placing the order. Download a complete .pdf of SJM10. Printing off is best done in colour. 5MB. We’re running out of funds! If you find SJM useful, please help us keep going by giving a donation for the amount of your choice using the big purple button on the right, buying print copies or subscribing for 3 issues a year. Thank you. 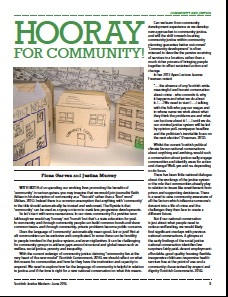 Fiona Garven and Justina Murray offer a critical review of community justice reforms in Scotland, connecting to ideas of community development “to support communities to discuss and understand community justice and linked issues around equalities, inclusion and what a good community can offer”. Victim Support Scotland acting CEO, Susan Gallagher, calls for a holistic approach to community and justice, recognising the needs and rights of victims, offenders, friends, family and the general public. Justice For Whom and What Community? 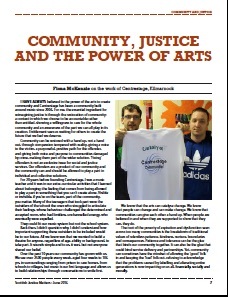 Fiona McKenzie considers the work of Centrestage, Kilmarnock and the power of the arts to create community. Ewan Aitken looks at the positive impact of prison visitor centres on reducing reoffending. From the Punitive to the Redemptive: one visit at a time. Chief Inspector Mark Leonard and Inspector Frank McCann look at the part played by communities in the strategy to prevent serious organised crime in Scotland. Nicki Wray of Barnado’s writes on third sector advocacy and the Community Justice (Scotland) Act 2016. 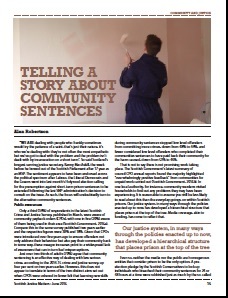 Journalist Alan Robertson calls on community justice services to be willing to help shape a narrative that supports why they work rather than purely why prison does not. Youth justice experts Claire Lightowler, Fiona Dyer and Debbie Nolan on the lessons to be learned from the Whole System Approach. Jamie Buchan draws on his research into Community Planning Partnerships (CPPs) to consider how they will manage new justice powers and responsibilities. 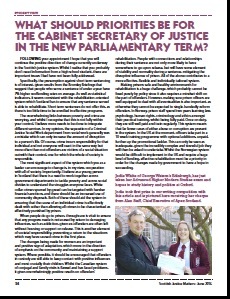 John Sturgeon reports on the achievements and frustrations of probation and community justice reform in France. Océane Lethien with John Sturgeon give a French perspective on Scottish criminal justice social work. Vivian Geiran, director of the Irish Probation Service and Michael Donnellan, director-general of the Irish Prison Service, explain their approaches to effective inter-agency cooperation and shared programmes. Mike McCarron considers the potential impact on drug policy in Scotland of prioritising prevention and systems thinking, and makes some suggestions. 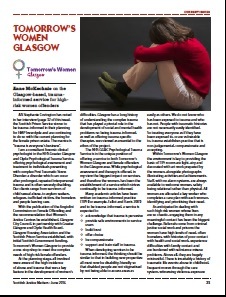 Anne McKechnie on Tomorrow’s Women, the Glasgow-based, trauma-informed service for high risk women offenders. Trish McCulloch and Mark Smith discuss their Creating Spaces for Change seminar programme in responding to offending behaviour. Nancy Loucks interviews Dr Stephanie Covington, co-director of the Centre for Gender and Justice in La Jolla, California, USA on trauma-informed justice for women. Our winner, Jodie White of George Watson’s Edinburgh, writes to Michael Matheson MSP outlining what she considers to be the priorities for the coming parliamentary term. Congratulations Jodie! Alison Hay, manager of Grampian Women’s Aid, shares her hectic and challenging routine. Susan McVie unpicks new approaches to violent crimes statistics and suggests that repeat violence counts against women may well be missing. Are Crime Statistics and Surveys hiding the Real Extent of Domestic Forms of Violence? 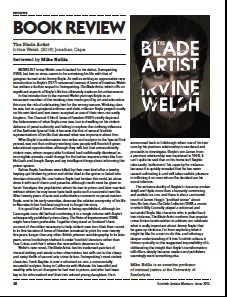 The Blade Artist, Irvine Welsh (2016) Jonathan Cape is reviewed by Mike Nellis who says that “popular crime fiction tends neither to address nor celebrate what is really important about Jimmy Boyle . . .”. Urban Legends: Gang Identity in the Post-Industrial City, Alistair Fraser (2015) Oxford University Press is reviewed by Gerry Mooney who thinks that “this is a powerful account of the lives of those involved in youth gangs . . .”.